HomeNews and AnnouncementsNewsA blessing from the Bishop! 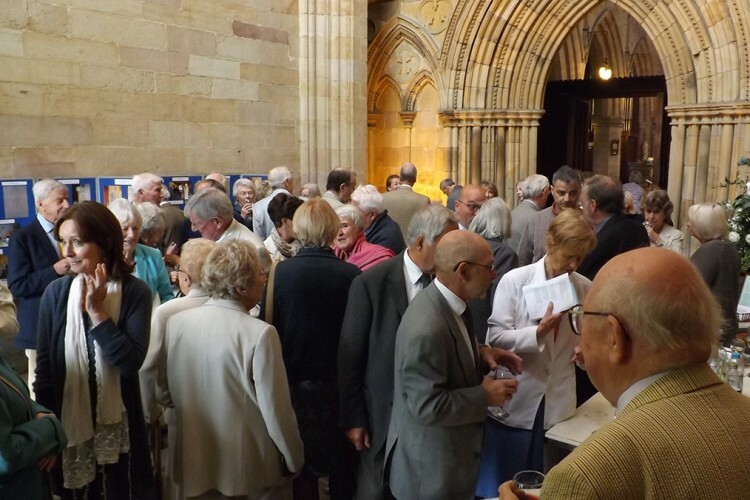 Bolton Priory welcomed the Bishop for the Ripon Episcopal Area, the Rt Revd James Bell, last Sunday 7th September. 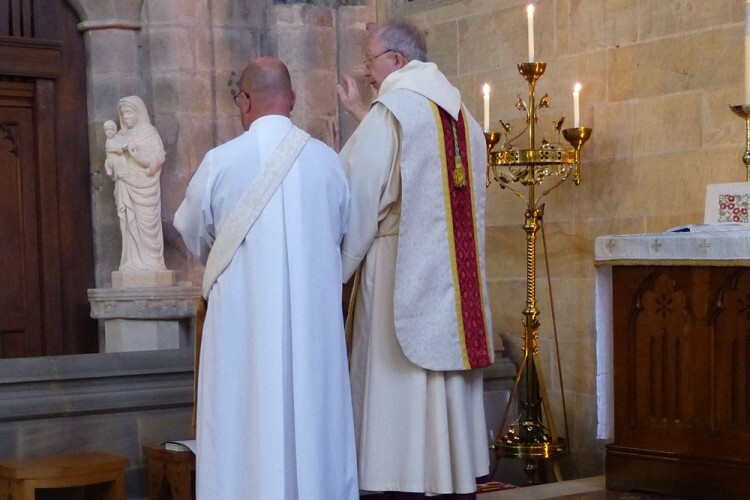 The Bishop was there to dedicate the new statue of the Virgin Mary holding the Christ child, created by York-based sculptor Tim Foster (see post of 18 August). “The statue is a wonderful tribute to Tim Foster’s artistic skill, and demonstrates the part churches can continue to play in encouraging the creative arts to flourish” commented the Rector. 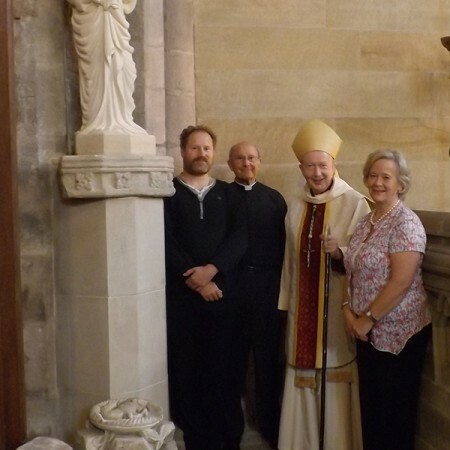 In the photograph the Bishop is shown with Tim Foster next to the statue, along with the Revd James Turnbull and Mrs Rosemary Murgatroyd, two of the members of the group that brought Tim’s commission to fruition. The Bishop’s sermon may be read here. 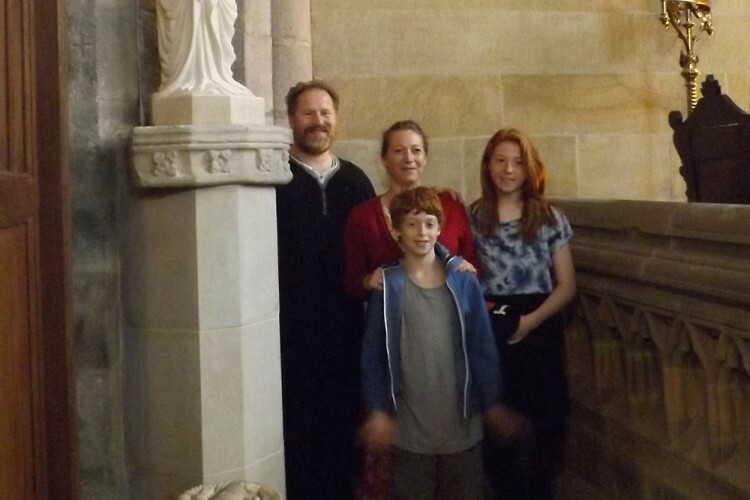 Tim has written about the artistic process that culminated in the statue that we see today. At the beginning of any commission, when approached to undertake any carving, there seems always to be a bewildering amount of information, influences, examples, styles and opinions – even on how we should refer to the job. 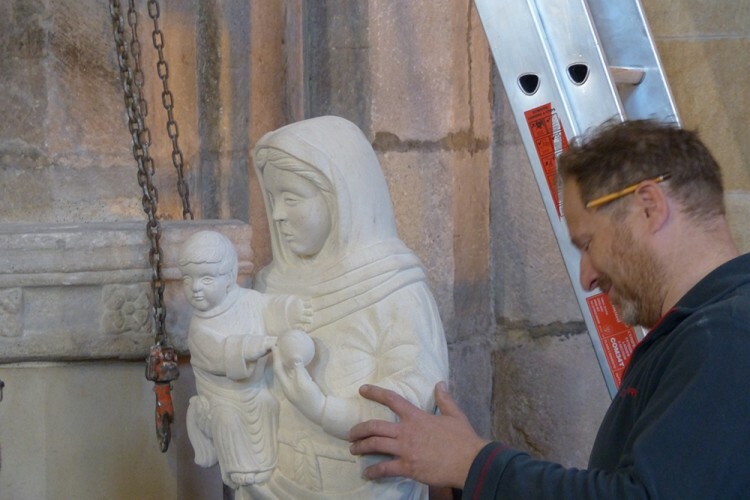 Various terms have been used along the way in this commission such as mother and child, Madonna, statue and statuette. 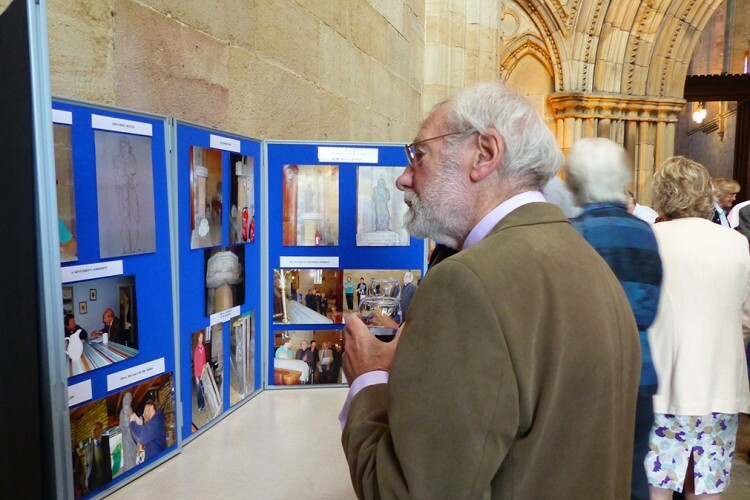 Various images were also suggested to express each person’s individual ideas of a statue for the Priory. At first the images seemed contradictory and difficult to merge without becoming a bolted together jumble, with such differing examples as abstract modern, clean forms sitting next to Gothic, Romanesque and Eric Gill. However all these images showed something else other than just style, and one thing I was confident about was that a committee of committed church goers would be comfortable with any of the iconography expressing a relationship between a mother and child. Very early on a view was expressed that the statue should convey the mother looking concerned, as if knowing what was to come, whilst retaining a motherly adoration; and that the child should be bright and eager as if reaching out. We decided quite early in the process that the best way of bringing all these ideas together would be to make a full size clay maquette which I could bring and place in position and make alterations as we saw fit. Scale and positioning became easier to determine with this method. The final piece of the design jigsaw, I felt, was the decision to include the apple. This brought the interaction between the figures to life and aesthetically joined the composition. Symbolically this is a reference to Jesus as the new Adam, reversing the effects of the Fall: the apple serves as a warning to beware the evils of the world. 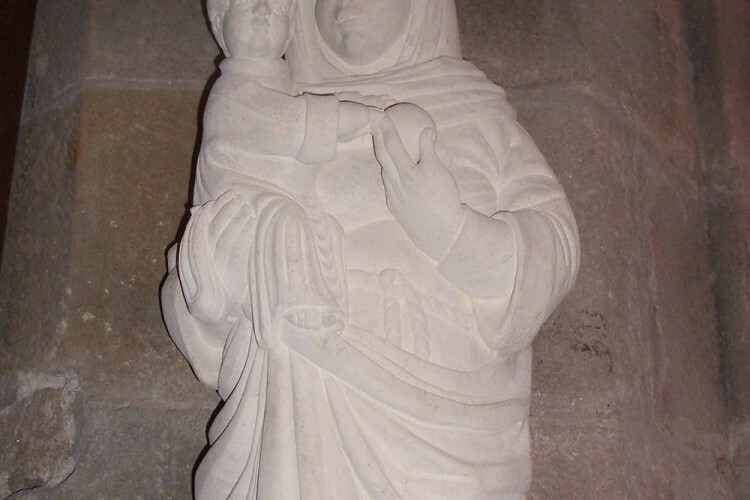 Many statues of Mary show her holding an apple and/or standing on a snake. Once the design was finalised we chose Ancaster limestone, which has a warm colour and a softness of appearance which suits the subject matter and the textured finishes. 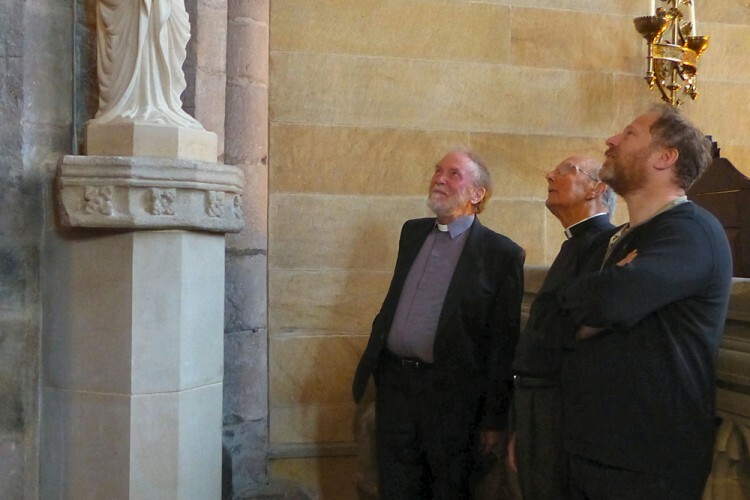 I hope you agree that the statue represents a satisfactory outcome for everyone involved with the process, for the whole Priory community, and for all who visit this beautiful church. Best wishes and many thanks to all. Tim. Bishop James blesses the statue. 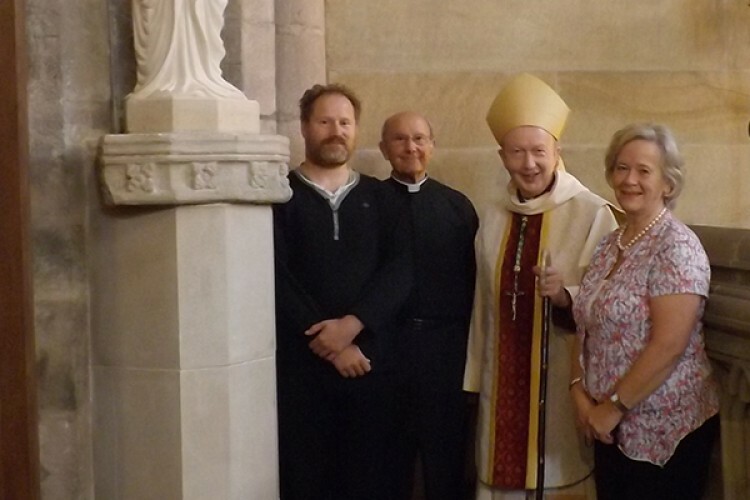 Bishop James Bell, pictured with the sculptor Tim Foster and two members of the statue project group, the Revd James Turnbull and Mrs Rosemary Murgatroyd. 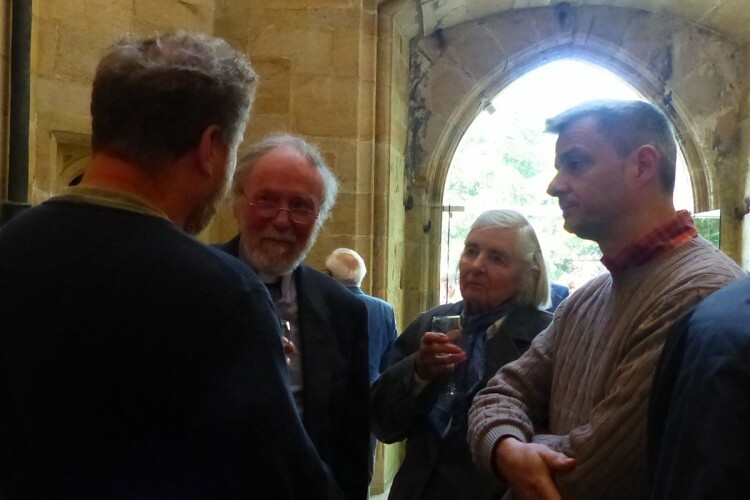 Tim Foster looking at his work, together with the Revds Armstrong (l) and Turnbull (r). An exhibition in the tower illustrated the creative process. Refreshments in the tower following the service. Tim Foster in conversation about the statue. The earlier installation of the statue. Close up detail of the statue.